We are a leading Manufacturer of planetary mixers from Thane, India. We offer wide range of Planetary Mixers for cosmetic industry which are obtainable in different specifications and capacities. 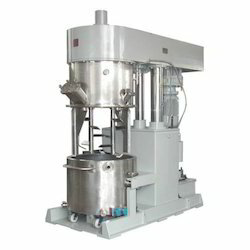 With excellent deaeration, these planetary mixers prevent the paste from becoming lumoy. With robust construction and durability, these planetary mixers and cosmetic mixers are widely used for mixing, degassing and kneading viscous and heat sensitive pastes. Our range includes double planetary mixer, double planetary mixer machine, commercial planetary mixer, industrial planetary mixers and industrial mixers. We also offer tailor made requirements. The speed of planetary mixers ranges from 100 rpm to 1000 rpm. Looking for Planetary Mixers ?